UCHealth Memorial Hospital is on the precipice of obtaining designation as a Baby Friendly USA hospital – a seal of approval recognizing the hospital as one that provides optimal care for mothers and infants who are delivered at the hospital. For the past four years, clinicians at Memorial have been mastering the elements of the 10-step Baby Friendly USA program that focuses on teaching new mothers how to breast-feed their infants and bond with them through skin-to-skin contact. From L-R: Dola Handley, a nurse manager on the Mother-Baby unit; Kerrie Burress, perinatal educator in Women’s Services; and Amy Eckert, director of Women’s Services; are instrumental in helping UCHealth Memorial Hospital become a Baby Friendly USA hospital. “The steps outlined by Baby Friendly USA help us achieve better outcomes for newborns and mothers who are choosing to exclusively breast-feed,’’ said Kerrie Burress, perinatal educator in Women’s Services at Memorial. 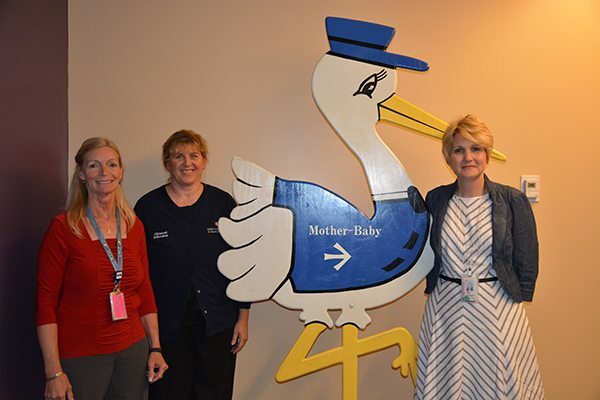 Since August is National Breastfeeding Awareness Month, clinicians in the Mother Baby Unit want to raise awareness about the hospital’s journey toward Baby Friendly USA status. In 2012, Memorial was among 90 hospitals nationally that received a grant from Best Fed Beginnings to be on a fast track to achieve the designation. The grant enabled Memorial to do extensive education with nurses in Women’s Services about the benefits of breast-feeding. Providers have learned about lactation services and another grant from the United States Breastfeeding Committee provided funds for a lactation consultant at Memorial to educate about Baby Friendly USA to community clinics, including primary care, pediatric and OB/Gyn, throughout Colorado Springs. Two UCHealth hospitals – Poudre Valley Hospital and Medical Center of the Rockies – are already Baby Friendly hospitals and University of Colorado Hospital is also pursuing the designation. While breast-feeding is a major focus of the program, Baby Friendly USA also touts the benefits of skin-to-skin contact between infants and their mothers. At delivery, if the mother and newborn are stable, the child is placed on the mother’s chest. This soothes and comforts the newborn. While Memorial expects to apply for the site visit by Baby Friendly USA in the coming months, the effort to prepare for a survey by experts already has resulted in moms and babies reaping the benefits. In 2012, an estimated 40 percent of moms exclusively breast-fed their babies. That number has now soared to 80 percent. Breast-feeding helps reduce the rate of diabetes, obesity and ear infections in children. “Maybe you don’t see the immediate benefits but the community benefit helps keep our patient population in our community healthier when mothers breast-feed,’’ Burress said. Encouraging skin-to-skin contact between mother and child in the initial hours after birth also helps promote breast-feeding and also helps babies physiologically. The baby has an easier time regulating his or her temperature and heart rate. “It’s calming, and it’s comfortable on mom’s chest. We encourage them to go on [with skin-to-skin contact] for several hours and we encourage them throughout their stay to get that skin-to-skin contact,’’ Handley said. While the contact provides benefits for the baby, it also helps the mother’s body prepare to breast-feed. There’s evidence of a hormonal release for the mother, which helps her body initiate the production of breast milk. “Even in the surgical suite, for mothers who have had a cesarean section, skin-to skin is not contraindicated, and it can be done safely with mothers who are stable and it has benefits,’’ Burress said. Skin-to-skin contacts contrast sharply with how deliveries occurred in the past. Clinicians usually took the child from the mother to measure the weight and length of the child and give the baby a bath. Now, a baby can stay with the mom up to eight hours before the child is bathed. “There used to be a separation there and that is not just dissatisfying, but we know there is evidence that it actually affects the baby’s thermal regulation and feeding cues. Babies are most alert during that first hour of life – so separating the mother and child means losing some prime opportunity for that bonding and breast-feeding to initiate,’’ Burress said. The mother and baby now stay together 23 of the 24 hours in a day. Memorial has already been recognized by the International Board of Lactation Consultant Examiners and International Lactation Consultant Association for excellence in lactation care. Memorial received the IBCLC Care Award in 2015 in recognition of staffing professionals who hold the prestigious International Board Certified Lactation Consultant Certification and for providing a lactation program that is available five to seven days a week for breast-feeding moms and their families. Memorial also supports mothers who don’t want to breast-feed their children or have medical issues that preclude them from doing so.